It was only a matter of time before we’d see our first clone of Microsoft’s Surface Studio. The uber-expensive new desktop computer is part iMac, part Wacom Cintiq display, and all kinds of cool looking. But when Dell showed Gizmodo the new Dell Canvas 27, a 27-inch touch-enabled display meant for artists and other creative types, the rep bristled at the clone label. The rep was quick to say that Dell had actually been working on the Canvas 27 for years and with zero knowledge of the Surface Studio’s development. Besides, the rep noted, the Canvas 27 isn’t even a $3000 computer with last year’s hardware in it. It’s a monitor (closer to the $1500 range) and you use it with your own Windows 10 computer. So really it’s less drool-worthy Surface Studio and more sturdy workman-like Cintiq. Yet the Cintiq, made by Wacom, has often been at the mercy of operating systems never intended for touch or pen input. The Canvas 27 will take advantage of all the tools built into the Windows 10 Creators Update and intended for Microsoft’s own giant screen with touch input. 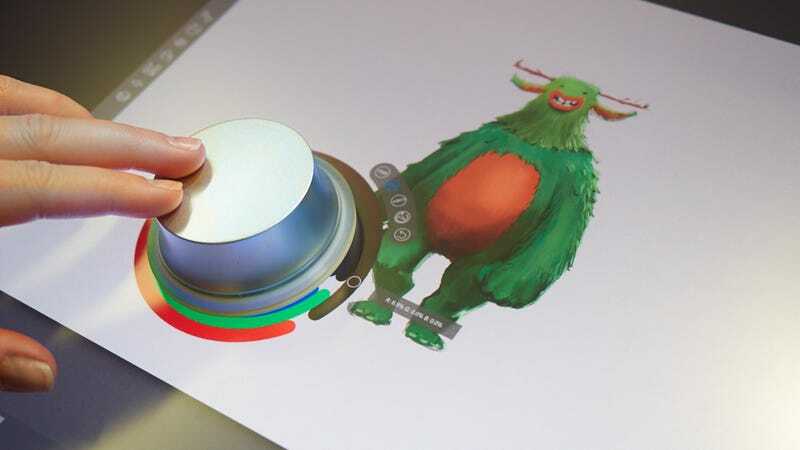 That includes the dial—which Dell calls a “totem.”It functions identically to Microsoft’s Dial, allowing users to adjust colors on the fly and quickly zoom, or change brush size, or even switch between apps. Dell’s also added a few of its own software tweaks including a touchpad and keyboard that appear on screen so you don’t have to make room for a keyboard and mouse on a table that already has to play host to the enormous Canvas 27. In fact Dell would very much like people to think of the Canvas 27 as a primary input device, which is why it was designed with the expectation that users would power a second, traditional display at the same time. The Canvas 27 is reportedly capable of rendering 100 percent of the Adobe RGB color space, which makes it ideal for photographers and graphic designers, and instead of a slick glass surface, Dell’s chosen a matte finish so that when the pen is press to the glass it feels more like writing on a piece of paper instead of a whiteboard. It should be available later this year, and while Dell has not announced a price, there were suggestions of it being less that $1500, which makes it a steal compared to the $1800-plus Cintiq or $3000-plus Surface Studio. If this thing can fulfill most of the promises Dell is making, it won’t be a Surface Studio-clone, it’ll be a Surface Studio-usurper.